Question: How Many Calls per hour, per day will my autodialer make? Answer: Typically autodialer systems make between 60 and 80 calls per hour per line. This assumes that your message is not longer than 40 seconds. Simply multiple the number of lines you have by the number of hours you’ll be dialing on a daily basis. For instance, (assuming a 40 second message) a single line system will make on the average about 840 calls per day if you plan on dialing for 12 hours, say 8 am to 8 pm. A 4-line system will make about 3360 calls during the same 12-hour period. A 96 line system will make about 80,640 calls during the same 12-hour period. Remember, with a shorter message you will make more calls, and with a longer message you’ll make fewer calls. Also, there are several other factors you should take into consideration. Add ring times to the number of seconds for each call. Say, on the average it will take 2 rings for a call to be answered. This means you should add 12 seconds to each call. Add a second for the system to make the determination whether it is reaching a live person or an answering machine or voice mail system. Add another second for the number to be dialed, and leave a few seconds for the dialing system to recognize that the called party has hung-up the phone. If someone tells you that a system will make 1000 to 1500 calls per day per line, they’re not telling you that you’d have to dial 15-24 hours per day to achieve these results. Question: How big a system or how many lines will I need? Answer: If you have less than 500 people to contact, you’ll probably be fine with a single line system to contact your entire group in a day. Remember that if peoples’ lines are busy or not answered, their numbers will be retried after the system makes its first dialing pass. If you have more than 500 people to contact in a 1-day period, you should consider starting out with a minimum of 2 lines. Also, remember that if you’ll have to contact people quickly – say for example in an emergency, you’ll need to calculate the number of calls you’ll need to make in a given unit of time. Emergency notification messages should be kept short – never longer than 20 seconds. Question: What kind of phone lines will I need? Answer: Typically, you can use your existing analog lines. When ordering lines from the phone company, just tell them you want standard lines with NO privacy package. If you want to transfer calls in your application, like, “Press the ‘1’ key now to transfer to a live operator, tell the phone company to add 3-WAY CALLING to your lines. If you’re purchasing a T1 system, have your service provider contact us before you order your lines. Question: Do I need to dedicate phone lines to the autodialer? Answer: If you are going to contact small groups, you can double-up (by using a phone splitter) on a fax line. Or if your group is small, you could double-up on one of your regular phone lines and make your calls after hours. If your group has over 500 members you should consider dedicating line(s). Realize, though, that when your autodialer system is dialing out and a call comes in, the calling party or fax machine will get a busy signal. Question: Will the dialer work with my digital phone system? Answer: Systems provided by TTI do not interface directly with digital phone system lines. But, virtually all manufacturers of digital phone systems provide what are called, “analog breakout ports”. These are extensions from your phone system designed to accommodate analog-based equipment like autodialers, fax machines and modems. Question: How do I initiate a call out session? On our PowerVoice Pro systems, calls are generally initiated from the computer housing the autodialer. On our PhoneTree ® systems, calls can be initiated at the computer, from a home, work or cell phone, or automatically by copying a file into a specified “trigger directory”. Question: Can I have sub-groups? Answer: The PowerVoice Pro system treats each sub-group as its own individual group. 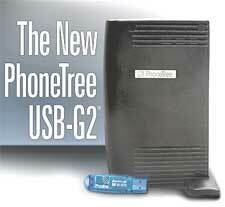 With PhoneTree ® systems, you have a master group. From this master you can easily create subgroups, 32 on the 2100 model, and 256 on other models. When someone calls in remotely to a PhoneTree ®, they’ll be able to enter their group or subgroup number, and this will automatically load the members from that particular group. Question: Will you help me to setup my system? What if I have continued questions? How long before I can get up and going? Answer: You should give yourself at least an hour to set up your autodialer. Our support teams can walk you through the process. Some customers don’t need to call support. Others have to be taken through the installation process step-by-step. The setup process is easiest for groups with existing members like churches, clubs, and associations. People using systems for marketing will require additional setup time because marketing functions require the use of the Do-Not-Call list. You won’t have to worry about the Do-Not-Call list if you are calling members of your group, but if you plan on contacting people you’ve had no previous communication with, you should give yourself an extra hour or two to deal with implementation of Do-Not-Call functionality. The support teams answer questions for 90 days on the PhoneTree products and for one year on the PowerVoice Pro series. If you feel you’ll require additional assistance on your system, you can request an extended support contract at the time you purchase your system. Also, you can purchase a contract at any time after you’ve received your system. Most people will be experts on their systems in less than a month, so in most cases, an extended support contract would not be required. Question: What are the differences between analog and digital lines? Answer: Analog lines are standard lines you receive from your phone company when you order lines for your home or small business. These lines can interface with your business phone system and remain analog, or they can be converted to digital signals by your phone system. If you can connect a standard phone, like the type you could inexpensively purchase at Radio Shack, you have analog lines or your phone system has analog lines. If you are at your office and you have feature phones with special buttons, your office system is likely digital. Autodialers can be connected to these systems through the use of analog breakout ports on your phone system. Many larger businesses now have T1 type digital lines coming directly into their phone systems. T1 Autodialers may be able to connect directly to these lines (only if they are dedicated to the dialer), but if you plan to connect your autodailer through your phone system, you’ll need to use the analog breakout ports of your phone system. Question: How do I get my list into the system? If I don’t have a list in a database format, can I enter in the numbers directly? Answer: If you don’t have a list already in a database, you’ll easily be able to type your names and phone numbers directly into our system. Our system would then become your database. Also, once you’ve typed in your data, you could share it with other database systems you might have. If you already have a list in a database like Excel or Access, all you’ll have to do is save your data file(s) as a .CSV file(s) (Comma Separated Value). This is easily accomplished through a single step process. After your file has been saved the autodialer software can easily import the file. A support tech can quickly walk you through the process. Question: How do I record my messages? Can I record them at different locations? Answer: TTI’s autodialers all come with microphones and Recording Studio software so you can easily record your messages at the computer where your system is installed. Additionally, you can call into your system and make recordings. You can record your messages at remote locations. You can even have a recording studio record them for you. They could then send or Email you the files. Question: What if my autodailer system doesn’t complete the session by the end of the day? Answer: All autodialer systems provided by TTI have start and stop times. If your session isn’t completed by the stop time you have set on a given day, the system will begin this incomplete campaign at the following day’s start time. Question: I’m a computer neophyte. Will this system be too complicated for me? Answer: Most of our systems can be set up in about half an hour. Telemarketers have to deal with the Do-Not-Call list, so they’ll have to download the list(s) they need and load them into our system. The longest part of this process is the actual downloading of the Do-Not-Call data. Most people get our autodialers running in a short period of time. Our support teams can answer questions, even walk you through the process. If you are a person that has absolutely no computer experience, you should consider getting a local person to help you. While we can show you how to use our systems, we can’t teach a person who has never used a computer. Question: I want to make random calls in my area just by entering the dialing prefix, will your system do this? Answer: We HIGHLY recommend against doing this. You will end up calling police and fire numbers, hospitals, doctors’ offices and many other people you don’t want to be bothering. In addition, most prefixes are not fully propagated, so you’ll be making many calls to numbers that don’t exist. If you need to blanket a specific area with calls, TTI offers telemarketing leads and data lists that will enable you to call only residential numbers for active phones. Question: How do I make sure that I don’t call people who are on the Do-Not-Call list? Do-Not-Call lists directly into our program. As it dials each number, it will check to see if it is on the Do-Not-Call list(s). If the number is on one of the No Call lists, it will be skipped. Question: Can I use your systems with VOIP lines? Answer: All autodialers that TTI sells will dial out on VOIP lines. Yet, there are several things you should be aware of. The first is that most VOIP lines don’t have the same voice quality as conventional lines. Because of this, dialing systems have higher error rates in distinguishing between live people from answering machines and voice mail systems. You are prohibited from using the Service or the Device for auto-dialing, continuous or extensive call forwarding, telemarketing (including, without limitation, charitable or political solicitation or polling), fax or voicemail broadcasting or fax or voicemail blasting. We reserve the right to immediately disconnect or modify your Service if we determine, in our sole and absolute discretion, that you have at any time used the Service or the Device for any of the aforementioned or similar activities.